Many of our patients in Monrovia come to our office in search of teeth whitening solutions to eliminate stains caused by smoking, as well as wine and coffee stains, stains caused by aging, and general discoloration of tooth enamel. Dr. Q specializes in teeth whitening and provides her patients in the Monrovia area with the most advanced products and technology to help you achieve a bright, white smile that radiates with health and vibrancy. There are various techniques and methods that may be used to improve your smile by whitening the enamel of your natural teeth. Tooth whitening is a simple and effective treatment that may be performed at our office in Monrovia, or at home, under the direction of Dr. Q. What Are the Causes of Stains and Discoloration in Tooth Enamel? In addition to smoking, the natural tannins contained in coffee, tea, and red wine may also contribute to staining. Foods that contain coloring agents and foods with naturally strong colors may also diminish the whiteness of your tooth enamel. Certain medications are also known to produce a dull, gray appearance in the teeth, and some teeth may become discolored due to trauma or injury. The inevitable and natural aging process may also cause teeth to become dull and gray. Dr. Q offers several types of teeth whitening treatments that are non-invasive and require no drilling or removal of the teeth’s natural enamel. You may choose a tooth whitening procedure performed in our comfortable office, and/or you may opt to perform teeth whitening at home using customized whitening trays that we can provide by casting a mold of your teeth, and a special peroxide gel formula that you must apply daily. 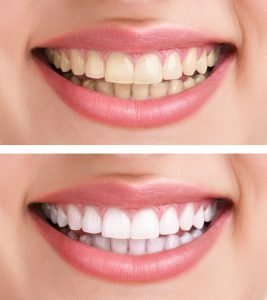 Teeth whitening performed in our office will produce faster results, whitening your teeth by several shades in only a matter of one or two hours, while teeth whitening performed at home may take up to 14 days to achieve your desired shade. Bear in mind that teeth whitening procedures do not produce permanent results, especially if you continue to smoke or consume coffee, tea, or wine. We recommend regular teeth whitening treatments performed yearly to maintain the gleaming whiteness you desire in your smile. The degree of improvement that may be achieved by teeth whitening treatments will vary considerably between patients, depending on the original color of your teeth, your age, and medical condition, as well as your daily habits. Teeth that have become more gray and dull may take much longer to reach the desired shade of whiteness than those with less degree of staining. Younger patients usually see faster and more dramatic results than older patients. If you live in Monrovia or nearby areas in California, and you’re ready to brighten your appearance by whitening your teeth to improve the condition of your smile, contact our friendly staff by calling our Monrovia-area office at (626) 599-9819.